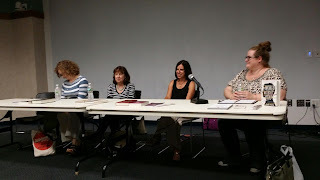 I have long been fascinated by the heart of the Salem Witch Trials, and when I started writing this strange little book featuring time travel and super powers, I knew I wanted to include Salem. In the novel, Bo's girlfriend, Sofía, gets stuck in the past...in Salem...during the witch trials...and she has the power to turn invisible, but not the ability to control it. Additionally, she's Latina with dark skin, features that the Puritans didn't really look too kindly upon (see also: Tituba). 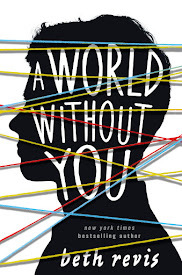 Fortunately, all of the Salem events in A World Without You take place during the past--because modern Salem was nothing like what I expected it to be! 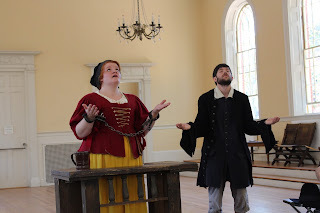 Here in North Carolina, we have the recreated village of Old Salem (similar to Colonial Williamsburg) where people dress in period costumes and showcase the age. 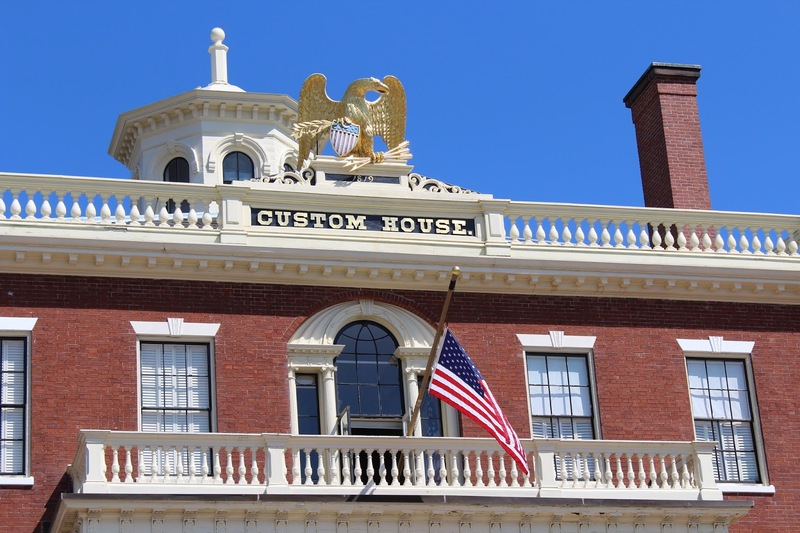 Everything's kind of contained in a historical district, and you meander around and learn stuff. That was...not really the case of Salem, MA. The town was sprawling--historical buildings weren't all grouped together in one small area, but spread out over miles, with many blocks of nonhistorical stuff between. And there was a strange mix of historical nautical stuff sponsored by the national park service and very commercial witch stuff put on by everyone else. 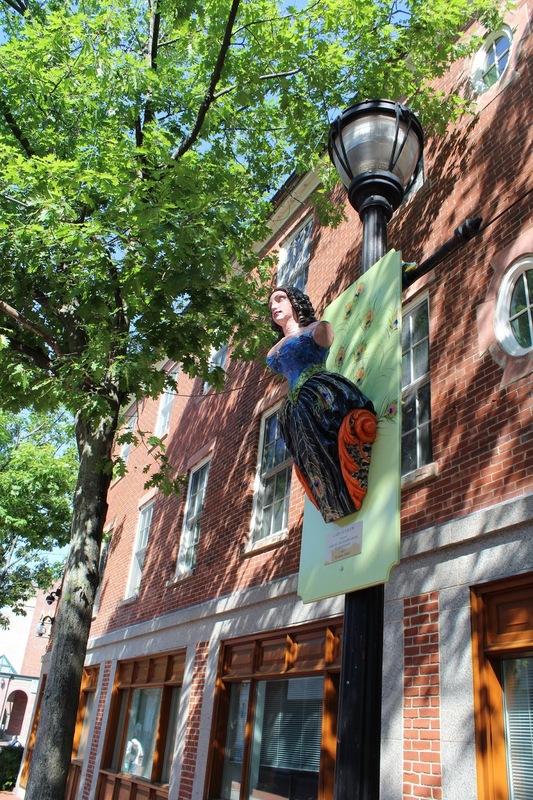 These beautiful figurehead carvings were interspersed throughout the town, and were a reminder that Salem was first and foremost a nautical city. Of course, the reason most tourists come to Salem is for the witch history, and there was a healthy mix of truly historical landmarks, accurate museums and tours, and purely sensational nonsense (all of which I'm all on board for, tbh). 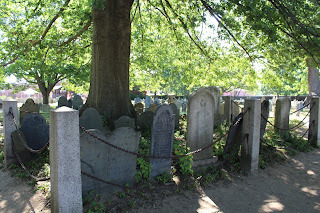 Early on we discovered the Burying Point, the oldest graveyard in Salem, dating back to 1637. 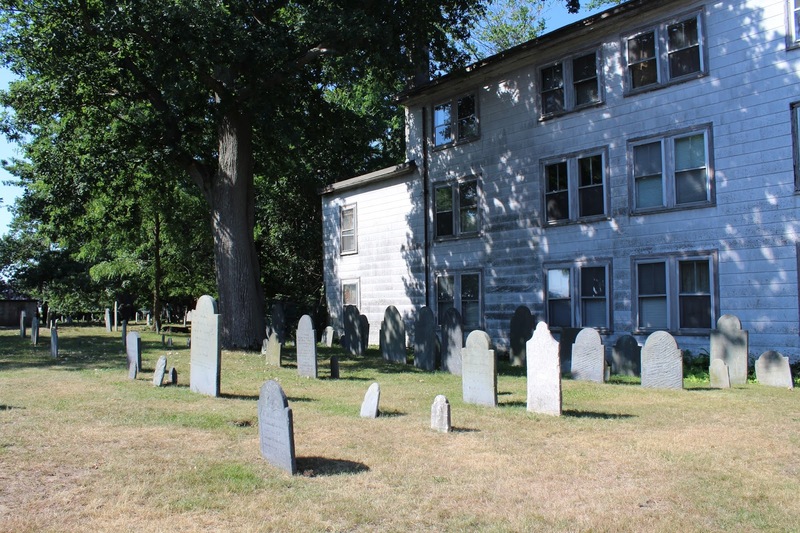 It's believed that some of the original colonists were buried in the area, but their graves were unmarked in order to disguise just how many people had died and avoid looking weak to the Native Americans. 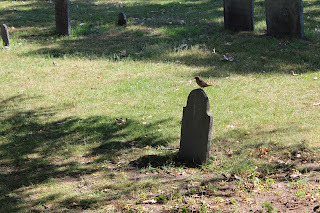 Anyone who knows me knows I love cemeteries. The older the better. 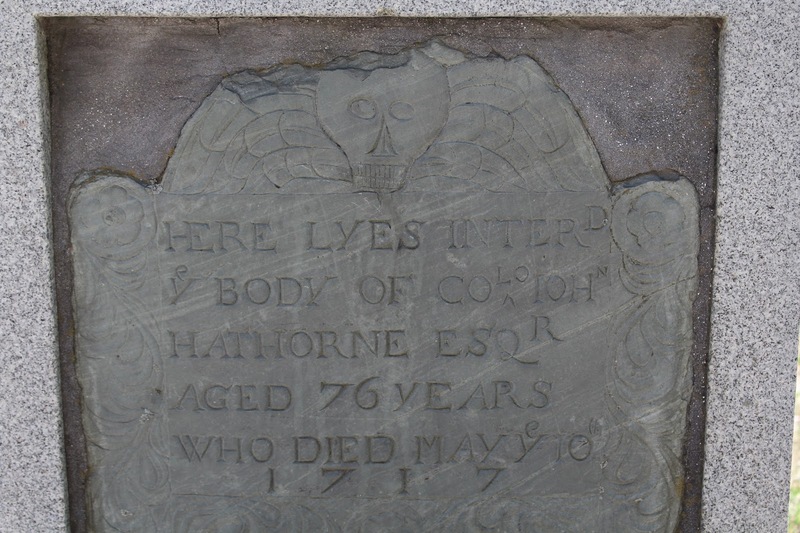 One of the first tombstones I found was that of Justice John Hathorne, who presided over many of the Salem Witch Trials as judge. Fun fact! Author Nathaniel Hawthorne is related to the Justice, but was so disgusted by his ancestor's participation in the Witch Trials that he changed the spelling of his own last name. 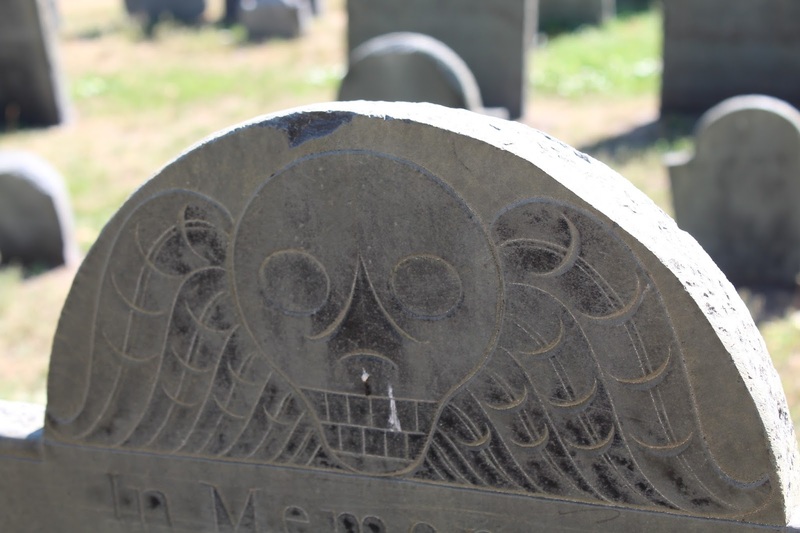 I loved the markings on many of the tombstones--particularly the winged skull, a reminder that life is fleeting, which adorned so many of them. 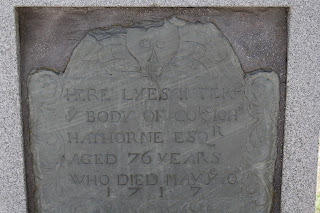 I was also smitten with the phrasing--many of the tombstones stated "here lies the body" of someone; it's a slight deviation from our more common "here lies," but a significant note. 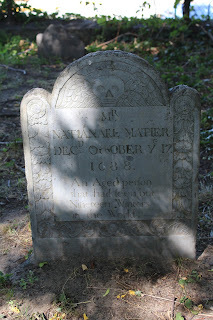 Near the back of the graveyard, behind an old house that belonged to Nathaniel Hawthorne's wife, I found the grave of Nathaniel Mather, brother to Cotton Mather. 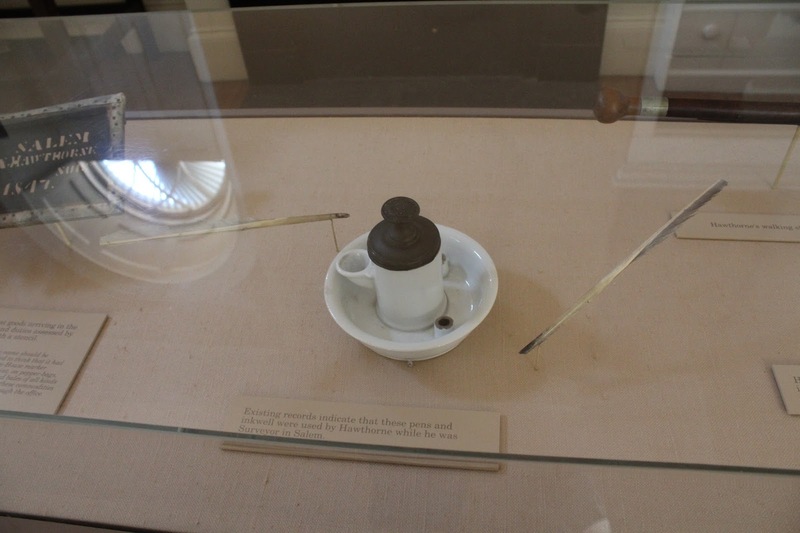 Cotton was a fascinating character--a scientist who provided significant research in hybridization and supported innoculations to prevent diseases, but who also was a full-hearted supported of the Salem Witch Trials. On the other side of the cemetery is the official memorial park. 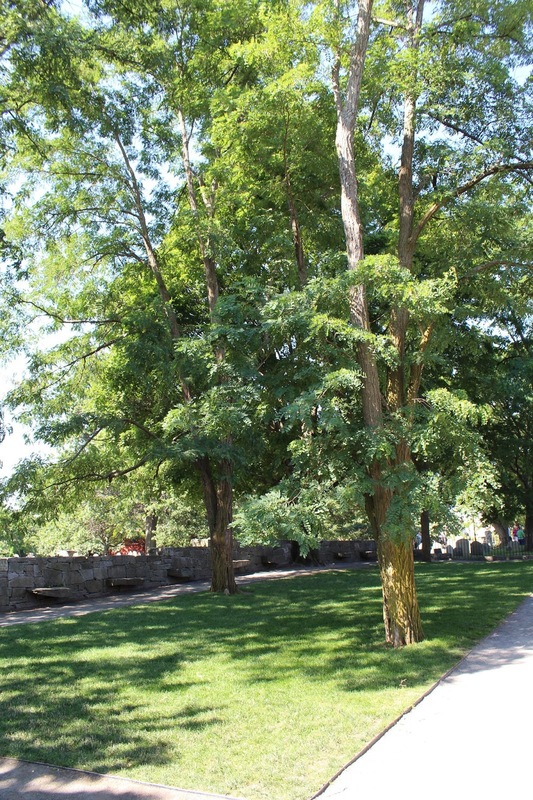 A tree-lined park is surrounded by twenty stone benches, each representing a different victim of the Trials. 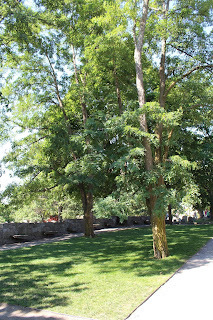 The park was dedicated by author and humanitarian Elie Wiesel. 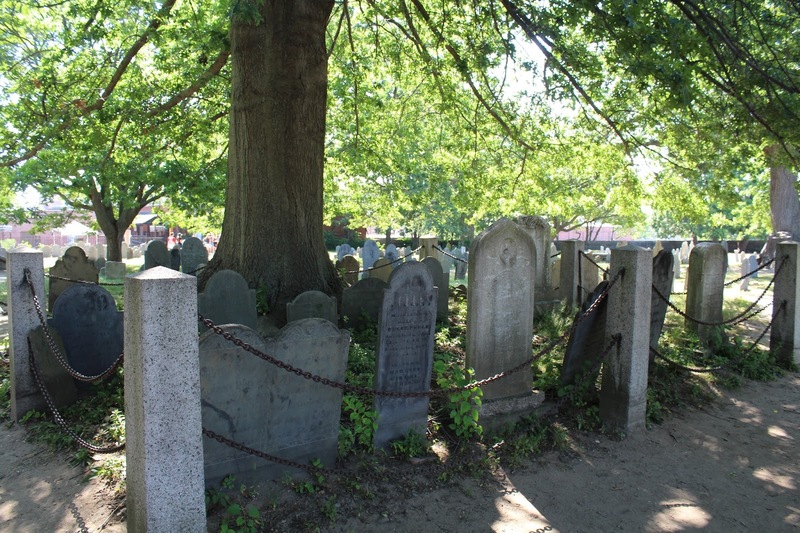 It's easy to get caught up in the sensationalism of the Witch Trials--and the countless "spooky" tours and "mystic" crap being peddled all around add to this--but it's hugely important to remember that there are real people beneath the graves. 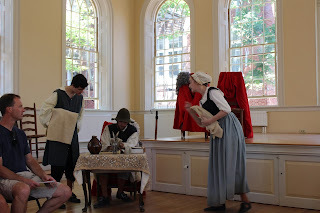 One of the things I liked best during my tour of Salem was a re-enactment play called Cry Innocent. In it, actors dressed in period costumes re-enact an actual trial, using actual transcripts. 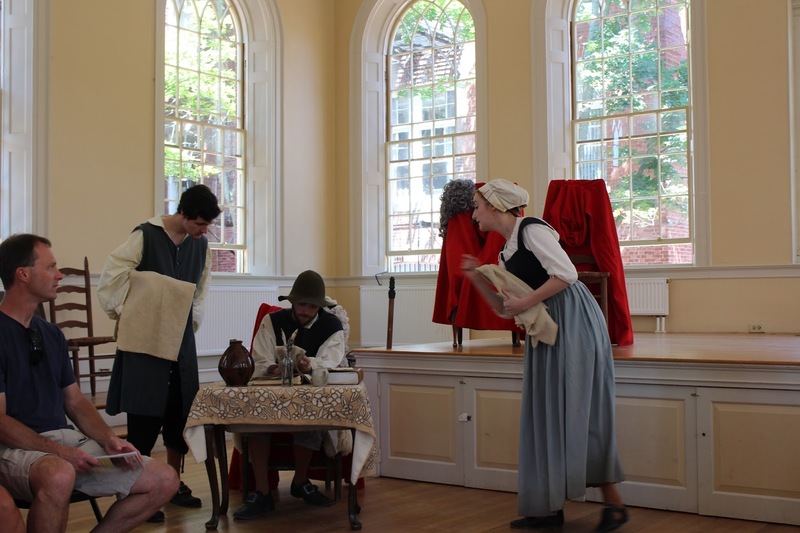 The audience is the jury and casts a vote at the end deciding whether Bridget Bishop is innocent or a witch. Our jury voted 12-11 on Bridget's innocence...but the actress told us in an afterward how Bridget was ultimately found guilty of witchcraft and hanged for her crimes. I really loved how interactive this play was--the actors sat amongst the audience, and the stage wasn't a stage so much as a trial room. 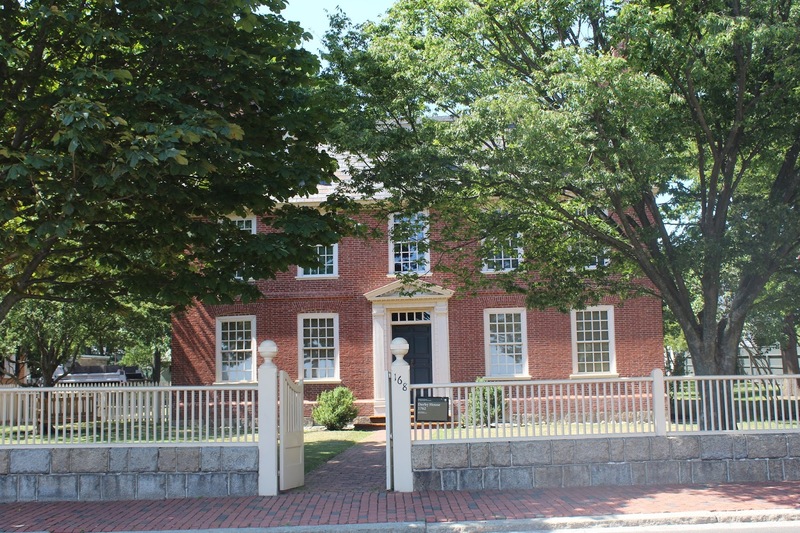 Periodically, the trial would "pause" so that the audience could interrogate Bridget or the witnesses against her, or ask for clarification from the judge (Justice Hawthorne). But what really stuck with me was just how...unjust the whole trial was. 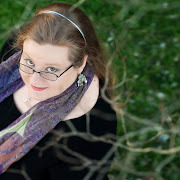 How can you prove you're not a witch? How can you prove you believe--or don't believe--anything? 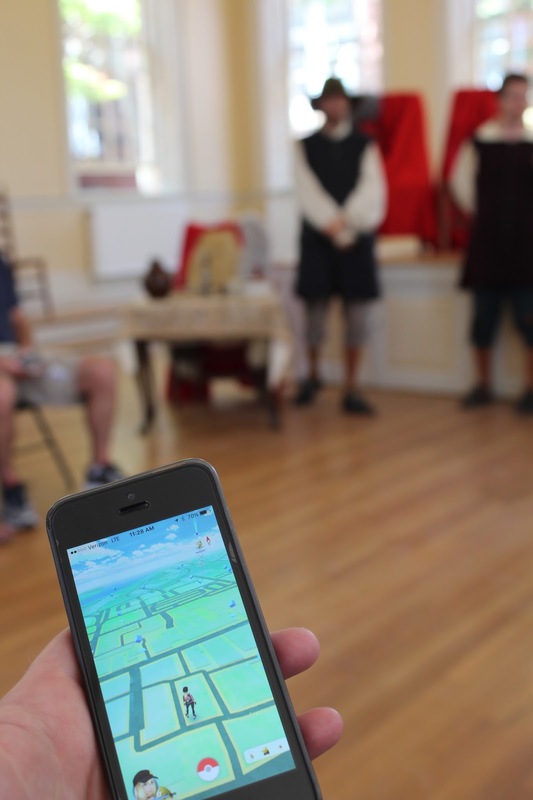 And just to add to how truly weird the world and time and history are, here I am playing Pokemon Go just before the re-enactment trial began... the future is strange, yo. Aside from the Witch Trials, one of the real people who is best remembered in Salem is author Nathaniel Hawthorne. Best known for The Scarlet Letter (which I've written many an essay on in my time), Hawthorne is also the author of several other books. 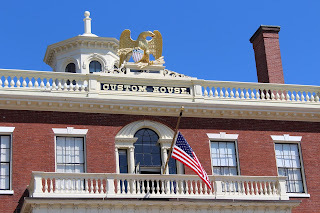 The Custom House overlooked the water, and Hawthorne worked as a surveyor here. 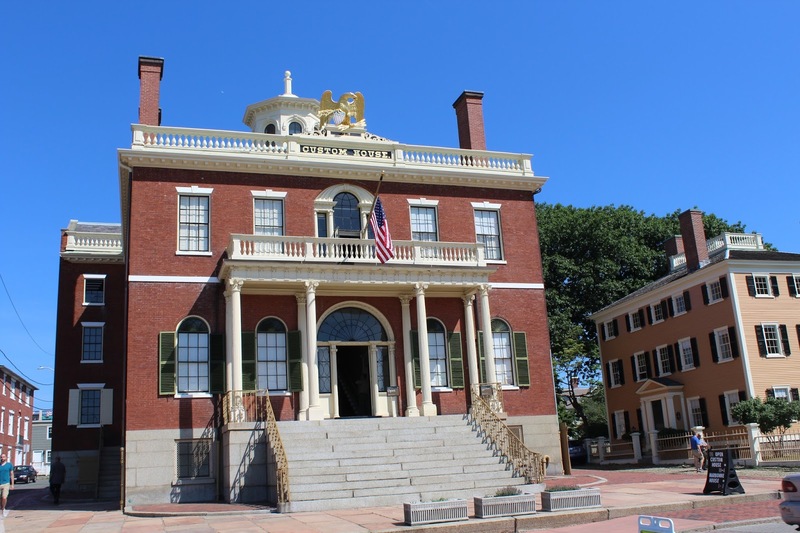 Anyone who's had to suffer through The Scarlet Letter may recognize this building (and the eagle) from the (omg so long and boring) preface at the beginning of the novel. What I loved? The story that Hawthorne was actually kind of terrible at his job, was fired after his political buddies left office, and spent time he was supposed to be working at his job instead working on his novels. 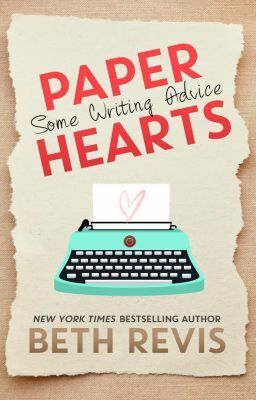 This made me love Hawthorne way more than any of his actual books. 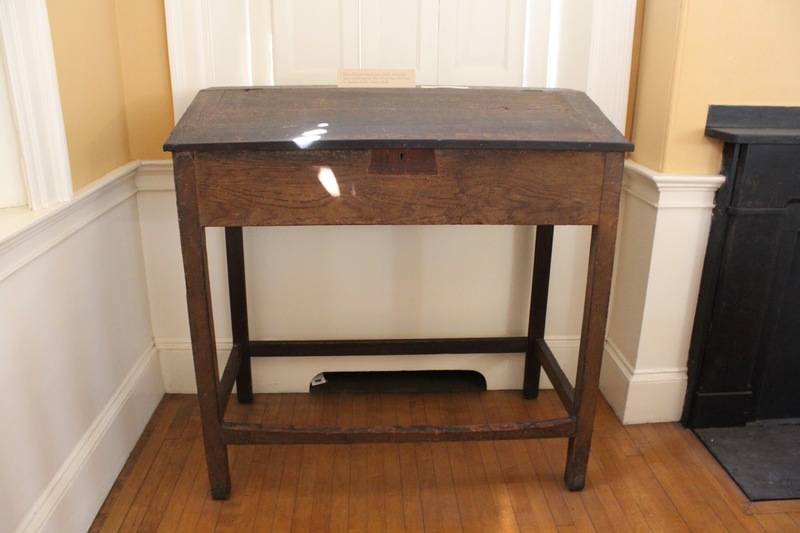 The little sign says that the above quill was one that was very likely used by Hawthorne while he wrote his books, and the desk below was Hawthorne's own. I expected to find all kinds of information about the Witch Trials at Salem, but in all honesty, aside from experiencing Cry Innocent and getting a stronger feel of the layout of the town, there were two things that really surprised me. 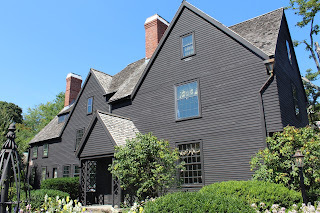 One was learning about the House of Seven Gables, made famous in the Nathaniel Hawthorne novel of the same name. We weren't allowed to take pictures inside, so all you get is this exterior shot. I'll be honest--I'm not really a fan of Hawthorne, and the only reason we toured this house is because, well...it was there and we had the time. But man, I'm glad I did! 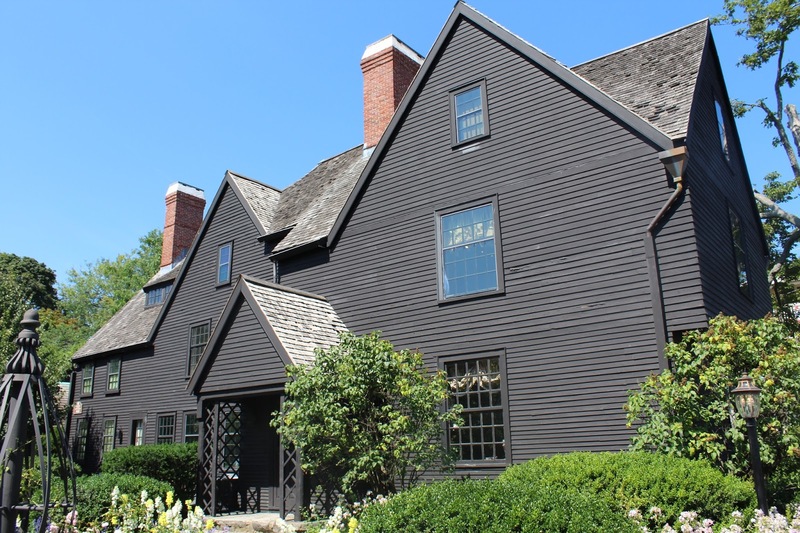 It wasn't the architecture that got me--although seven gables is seven more than my house has. It wasn't the period decorations, or even the history. It was the mother-flipping secret passage. 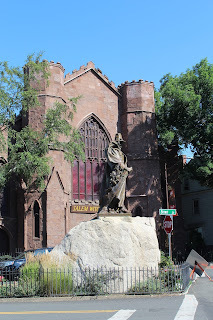 While Salem was nothing like I expected, I loved discovering some of its secrets! 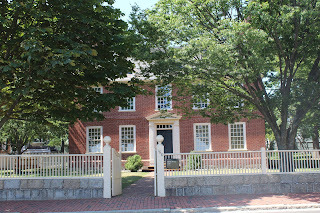 After visiting Salem, I made a mad dash through insane traffic (you guys were not kidding about Massachusetts traffic!) 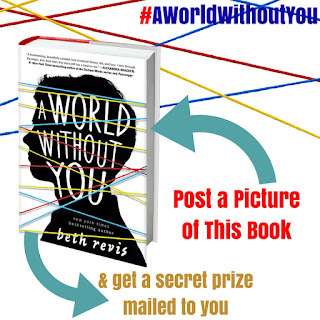 in order to get to my second signing. 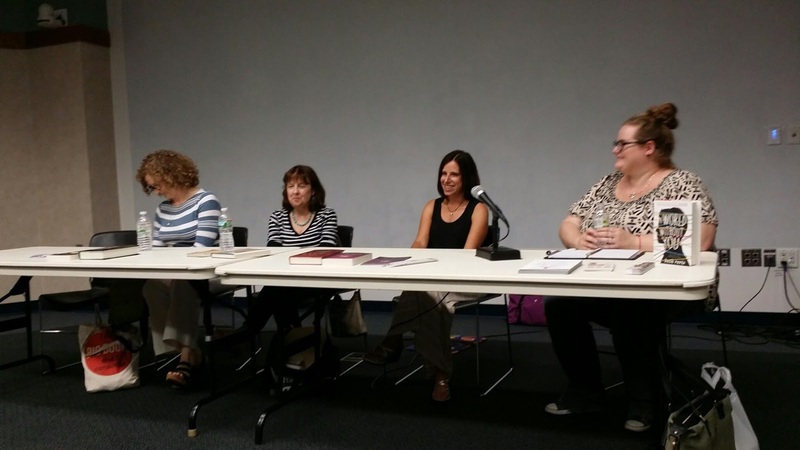 Hosted by the Wellesley Free Library in conjunction with Wellesley Books, I got the chance to discuss relationships in literature with Julie Berry, Lori Goldstein, and Emily Ross! And across from the library was this castle-like structure (which I think was city hall?). It would make an excellent Berkshire Academy, no?